' - Does self-sacrifice strengthen one's own resolve and self-respect?
' - Does it inspire the hesitant to take comparable action?
' - Can it work, i.e., cause government to shrivel up and vanish? As to the first, self-respect, I'm almost sure it does. To take a stand against evil is a noble thing, no question of it. After taking one, the taker feels ten feet tall, and there's not much wrong with that! The converse, too, provides supporting reason to believe it; if in some confrontation with Authority one bows the head and submits when it would have been feasible to resist, one may forever be haunted by the memory. Before we leave this part of the question, though, let's pause: Self-sacrifice runs counter to all we understand, does it not, about rational ethics? Our whole understanding of life begins with the axiom that each owns himself, and therefore rationally "ethical" behavior consists of anything which augments, improves or prolongs that life, that primary asset. Certainly, self-respect and its elevation is an important part of such improvement--but self-sacrifice, by its nature, must conflict with that rational purpose of life-enhancement! As Joe Goodson reminded us, "nothing is worth dying for." Thus, the morality of diving in to rescue a drowning person depends on whether in one's instant opinion the risk of dying would be offset by one's increase in self-esteem if the rescue succeeded. This rational basis contrasts with the more familiar irrational or religious basis, which blindly holds that the highest "good" is to sacrifice oneself for others. Sheer nonsense, because if followed fully (a) goodness for some depends entirely on having a supply of bad guys calling for self-sacrifice, so condemning them to eternal badness, and (b) all good people would die, leaving the gene pool to bad ones. Now, that is not to say that we'll not each have ugly choices thrust upon us--merely that we shouldn't seek them out. Government is so monstrously intrusive that we can't avoid eventually having to decide whether or not to say "No!" and so becoming its victim in a heavier sense than usual. Each of us, however, must draw that line where he will. For some, a law banning homeschooling is the line they will not cross. Even there, however, there is a choice (apart from submission): one can defy the law (and seriously risk both imprisonment and loss of the very children one is hoping to protect from government indoctrinators!) or else one can simply relocate, to a state or other country where no such barbarous law exists. So far, there remain plenty. Sometimes, yes, self-sacrifice is the only moral choice. But often there's an easier way. How then about the second, inspiring others? A good case for the affirmative can be made here too, and in modern times, no image is better known than this photo of an unknown Chinese rebel, taken on June 5th, 1989 . 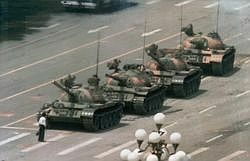 Single-handedly he put his life directly on the line so as to defy government authority in the shape of four tanks that could crush him like a bug, and he prevailed. Surely, individualists the world over took heart from that example? Yes, probably. The image is not specific, however; we know next to nothing about this brave person. Why did he so passionately oppose the PRC government? There were many socialists protesting in Tiananmen Square that week, as well as liberals and capitalist students. Was he even protesting too little communism? We don't know. Nobody said. He gave the world an image, nothing more. No explanation, no systematic presentation of an alternative way for society to function. He could not, of course, he had only a few minutes, so he's not to be blamed. But that, it seems to me, is the weakness of the incident; it is mute. In some deep-seated way, we know we admire him, but we have only a vague idea of what it was he stood for, so how exactly can we be inspired to follow his example? Are we, for example, to protest everything and anything, mindlessly breaking store windows like the protectionist mob in Seattle a few years back? I hope not. That brings us to the third part of the question: Can self-sacrifice terminate government, which is what we market anarchists are all about achieving? This is to ask not so much about the morality as about the utility of sacrifice, in our case. In this context, self-sacrifice is often called "passive resistance," and the hero held up as the prime example is Mahatma Gandhi, who never used violence but instead inspired tens of millions of Indians to go on strike or otherwise peacefully break the laws of the occupying British so as to monkeywrench their administration; and sure enough, they left of they own accord in 1947. That didn't terminate government, but it did terminate colonial government, which seemed a major triumph. Gandhi and his friends were often beaten and imprisoned, and some were killed, and this high-caste and well-educated lawyer lived his life by choice in deep poverty like a peasant, spinning cotton. Plenty of self-sacrifice, followed by great success. Does not Gandhi's example prove the point, that self-sacrifice is not just noble, but also works in practice? Not in my opinion, and here's why. First, the map shows (as pink bits) over 20 large British colonies in 1920, and there were many others, too small to see on this scale; but by 1970, not one of them remained (except the Falklands , which I forgot.) Thus, the British government was shedding colonies in that half-century at the rate of about one per year; India was simply one among many and would have been made independent in or around 1947 even if Gandhi had never left South Africa . Possibly he brought the timetable forward a year or so, but that is the most one can say of his political "triumph." The fact is that all colonies had become liabilities, not assets. Second, the influence of his undoubted piety was, though non-zero, limited. When independence came, it was accompanied by widespread massacre of Muslims by Hindus and vice-versa, and by the partition of Pakistan . He opposed both, yet couldn't prevent them. So yes, he was an important part of the mix--but no more than that; according to Richard Grenier, "the British killed some 400 seditious colonials at Amritsar and the name Amritsar lives in infamy, while Indians may have killed some four million of their own countrymen for no other reason than that they were of a different religious faith, and people think their great leader would make an inspirational subject for a movie . . . ." Quite possibly, if Gandhi's absence from the scene had delayed independence by a year or so, it would have taken place with less slaughter and more decorum. Third, his grasp of philosophy and economics was so feeble that he "inspired" millions of peasants deliberately to try to reverse the huge benefits of international trade, mechanization and division of labor, so prolonging poverty by a further one or two generations and helping install Socialism for 40 years, operated by his close friend Pandit Nehru and successors. Only when Rajiv Gandhi (no relation) took the hint from Maggie Thatcher and started loosening the grip of the Indian bureaucracy in the 1980s did prospects for the country's wealth improve. Fourth, any impact Gandhi did have upon the move to independence was made possible only by the widespread existing resentment of foreign rule, and by the fact that most Indians had nothing to lose. In 2007 America there is far too little widespread resentment of government and very, very few people have nothing to lose; the two situations are simply not comparable. And lastly, the whole horizon of this son of a provincial Prime Minister was limited to the political arena. Apparently, this "great spirit" had no notion that the political arena was fatally flawed and oppressive in itself, regardless of who runs it. So it is fair to say he was a fine political reformer; but we seek not to reform politics, but to bury them. What else, then, will suffice for that purpose? I've suggested that deliberate self-sacrifice is immoral, ill-focused and unproductive--so I'd better end on a positive note. It comes together, it seems to me, in re-education. When and only when everyone in society understands what freedom means and therefore wants it, it will take place--not because nonviolent resistance has somehow obliged government to renegotiate an alleged social contract, but because nobody will any longer support its very existence. Apart from finding one other new student a year, the only action called for from graduates of The On Line Freedom Academy, for example, is to enjoy a normal life--but not to support government by voting for it or, especially, by working for it; the key suggestion is to change jobs, to move out of the parasite sector as soon as a good opportunity is found. Eventual result: when the last irreducible set of government junkies issues orders, like Hitler in his Berlin bunker, nobody will be there to see that they are obeyed.